How To Help With Anxiety? Someone who is trying to deal with generalized anxiety disorder (GAD) often needs more than just therapy and medication to overcome their anxiety. One of the most important things, that can contribute to and speed up recovery time, is understanding friends and relatives who will offer them support and understanding without judging them. Friends and family can be an important part of the treatment and can make a huge difference in recovery time as well as helping to prevent relapses. The following are some helpful guidelines on how to help with anxiety if a friend or family member is suffering from GAD. It may sound straight forward but you will find it much easier to be understanding and helpful if you try to learn exactly what your friend or relative is experiencing. There are a huge number of symptoms of anxiety and everyone who suffers from anxiety will experience a different combination of these symptoms. Reading through this website and finding a good reference book on the subject is a good place to start. If someone hasn’t yet been diagnosed or is worried about seeking professional help, a supportive friend can often help them with the first step on the road to recovery. Helping someone to find the right help, perhaps even going to the doctor with them to offer support can be a huge help. 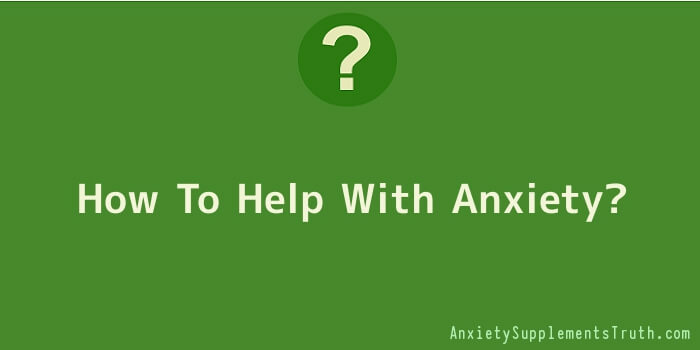 Read up on the different anxiety treatments and anxiety self help programmes available so that you know what is out there to help people with anxiety. But…don’t push too hard. Sometimes people need to come round to the idea that they have a problem in their own time. Being too pushy can alienate them and achieve the complete opposite of what you are trying to do. Be understanding and step back willingly if your suggestions are readily accepted. You’d think that this would go without saying but being supportive is actually hard work. You need to be able to listen actively, without becoming frustrated or offering opinions. Sometimes, just encouraging someone to carry on with treatment is the difference between them recovering or not. Listen to the person you are trying to help. Make sure that the help and support you are offering is the type of help and support that they want. Respecting someone’s boundaries is important if you don’t want to add to their anxiety. Don’t underestimate the effects of being in a relationship with someone who is suffering from GAD. It can be extremely difficult to maintain your own positivity and it is very easy to become worn out and frustrated by their behaviour. Make sure that you keep the balance in your life, see other friends, and step away from the situation occasionally to help recharge your batteries. Seeing a therapist or counsellor yourself can actually help you to remain strong for your friend but do be careful not to betray any of their confidences. Stay cheerful, be fun to be with. If someone is suffering from anxiety they don’t just need a shoulder to cry on, they also need someone who is fun to be with and who can help them to take their mind off their anxieties. Distraction is a recognised coping technique for people who suffer from anxiety. It is so easy to become very introverted and wrapped up in their worries. Being fun and someone that they can relax with is a great way to counteract this. The above are general guidelines but there are a few specifics that it is worth talking about. Never tell someone not to worry. It is so easy to be overprotective and come out with phrases like, “stop worrying”, “It’s not important”, “it’s nothing to worry about”. This can come across as extremely patronizing and is best avoided. The person who is suffering from anxiety knows that they are worrying too much, even if it’s on a sub-conscious level. Try to show empathy and understanding. Don’t start trying to solve problems for them. It is not one situation that is causing them problems. Trying to solve the things that are worrying them won’t help them to recover from anxiety. It may well help in the very short term but if they have an anxiety disorder they will find something else to worry about. Instead simply try to be supportive and help your friend to learn how to deal with the underlying anxiety disorder. Avoid doing too much. It is very easy to take on too much responsibility as a helper and to start trying to do everything for your friend. Avoid taking on all your friends’ problems. They don’t need to become dependent on someone. Instead encourage them to get help for their anxiety and work with them to help them to manage their own problems. Remember, how difficult it can be to spend time with someone who has an anxiety disorder. It is very easy to become inpatient with them as some people can take several years to fully recover from generalized anxiety disorder. Be patient, be supportive but within your own limits.